When you find coupons in your local paper, you're going to want to try new places! 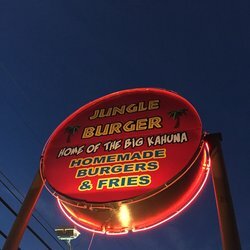 We decided to try out Jungle Burger in Sherman, Texas and I just had to write this review even though this wasn't a review opportunity! Walking into there, the place was very vibrantly painted and was definitely an eye catcher. There were plenty of places to sit whether it be in a booth or a table. We chose to sit near the restrooms so that if our daughter needed to go she could quickly and we also didn't want to bother a family on the other side of the restaurant if she got hyper or something. Outside on the sign it says "1/2 combos for $8." but unfortunately that isn't comboS, it's a combo. The traditional hamburger combo would be $8.00 but if you want cheese it's more. I will admit, when I saw the prices on the menu we almost got up and left because even with the coupon we weren't planning on spending that much money. Then we realized if you go to McDonald's and get two combos you almost spend that much and you never feel full. So we stayed. I ordered just the cheeseburger combo cooked medium well, with fries and a drink. My husband ordered the cheeseburger that included the Texas Toothpicks (fried jalapeno slices into sticks) also cooked medium well with fries and a drink. We got our daughter their chicken nuggets combo which came with six nuggets, fries, and a drink. I also requested on my burger that it be grilled onions. When our daughter's food was finished, they brought it out first which I did request and we were pleasantly surprised! The chicken nuggets were HUGE these weren't dinky little McDonald's size! The fries are freshly cut these are not frozen so right away we started to feel better about the price. I don't have pictures of the food but I can say this..THIS IS WORTH THE PRICE! Soon as our burgers came out we were overwhelmed in a good way! The burgers were so big, and perfectly cooked. You could see it was angus beef not a "meat mixture" you get from most places. Shredded lettuce (which my husband raved about), fresh pickles that tasted like pickles not like the juice/vinegar mix they sit in for days upon days. Everything tasted fantastic, I just kept going "mmm" over and over. My husband normally has a bad experience anywhere he goes somehow his food is always done wrong. He says it's the curse all food workers get when they work in the food industry for too long. But nope, this was perfection! I even had to tell the waitress and the manager how fantastic the food was I could NOT stop eating even after I felt full! Now here's the kicker that tells you this is truly fantastic: Normally we will take our leftovers home and our daughter will eat hers but I won't. If you leave the food in the boxes too long before you get home (like having to run to the store) you just in your mind sometimes will think "Eh, no it's too soggy now". Ha, not this food! Soon as we got home I had it back in the microwave and it was gone within ten minutes. (Though think two hours from when we finished eating because we did go to the grocery store). Still tasted fantastic, and still had that wonderful grilled taste to the meat. I will be honest we won't be able to go often unless money is evened out and that's just like the majority of families here in the area. But when the coupons are there (right now in Sherman you can find a coupon for a free kid's meal with the purchase of two 1/2 combos) we will definitely be back! Also, a huge thank you to the manager of Jungle Burger he not only cooked the food but came out to the table just to let us tell him how amazing it was. 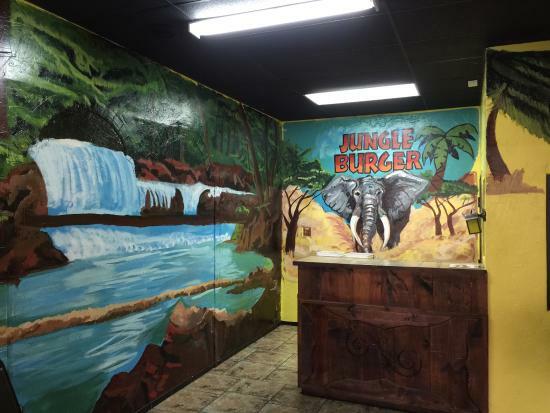 Jungle Burger is a chain so you may find one in your area but if you are ever traveling in or around the Sherman location, make sure to stop in off Texoma Parkway! I don't know this place, but the food sure does look yummy. And the ambience looks like fun. A night out this weekend is called for, I think, to a burger place! Thanks for inspiring it.